Unlike Greg, I have not been very good about cross posting entries from the Analogue Hobbies Painting Challenge, but have been participating in it as well. So, rather than cross post 4 different entries each separately now, I am just going to post some highlights from each and a link to the original if anyone wants to see some more detail. I will try to remember to cross post more regularly as we move forward. On the plus side, I have painted over 400 points in the first month of the challenge, so have already hit 40% of my goal this year! Not that I am staying on my planned items at all, but that's a whole different story. Day 1 and I started out with five 35mm scale Kingdom Death survivors. These are bare bones starting survivors so all they have are lanterns and founding stones (sharpened stones as makeshift knives). The survivors all have a very basic attempt at OSL (Object Source Lighting) for the lanterns on them, but only very basic. They are after all basic survivors and game pieces, which both of my sons (and all their friends) will handle while playing Kingdom Death as they just can't get enough of the game. Ok, another day another entry! Sticking with the Kingdom Death theme I worked on the first and second monster that most players with fight, the White Lion and the Screaming Antelope. However, in typical KD style there is nothing normal about these seemingly normally named creatures. 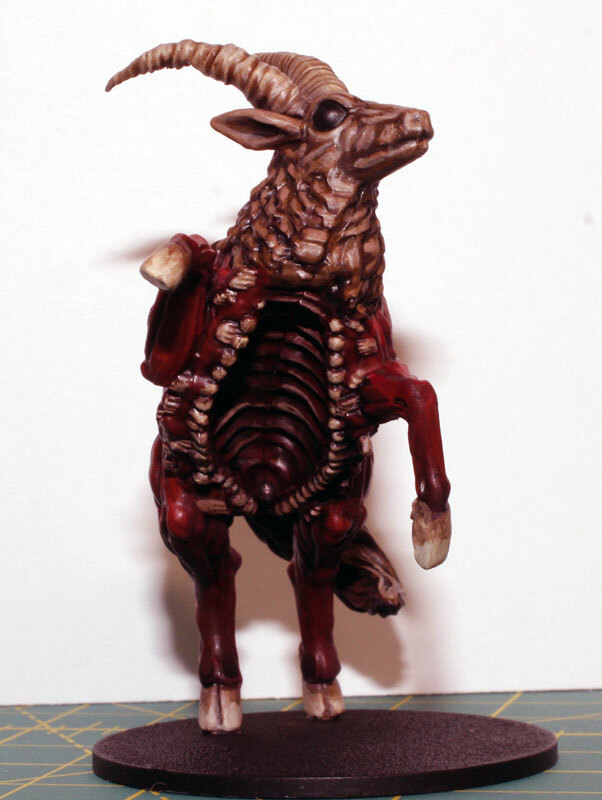 The Lion has strangely human hands and the Antelope has a mouth where its gut should be. 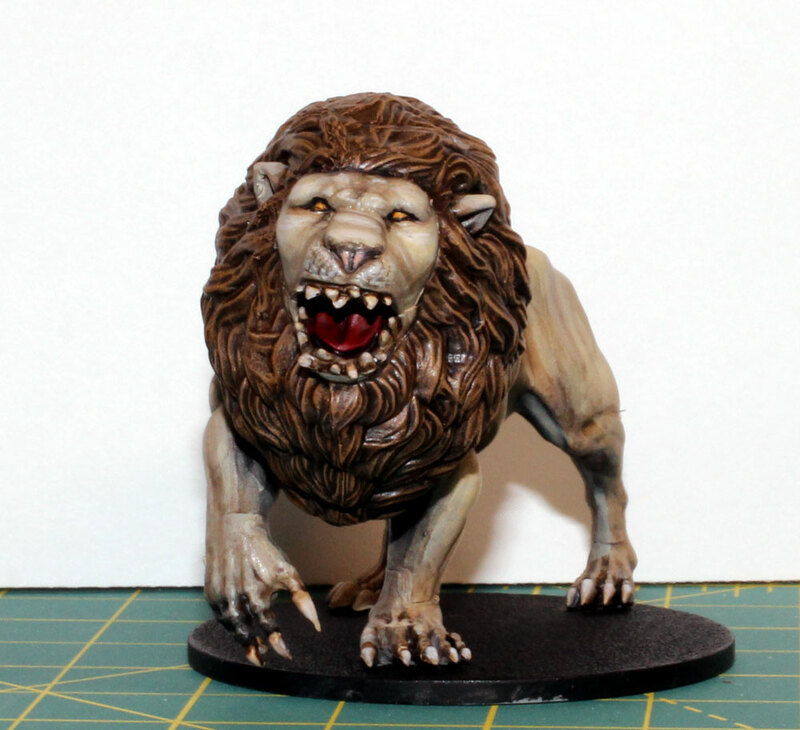 there is nothing small about Kingdom Death! All of my Kingdom Death figures are going to be played with and I want them to be very visual, so a lot of the highlights and shadows are a lot more pronounced than most of my painting. This is being done on purpose to show up and emphasis the details from tabletop. While not as clean looking in these close up pictures as some of my figures, they do really pop at tabletop distance better than a lot of things that I shade in using more subtle colour variations. tried doing everything to match my current 28mm Death Guard 30k army. I figured out early on though that I can not do the same weathering as on my 28mm models as in 6mm the models just become sepia / rust coloured blobs. So I went with a much harder light / dark look. 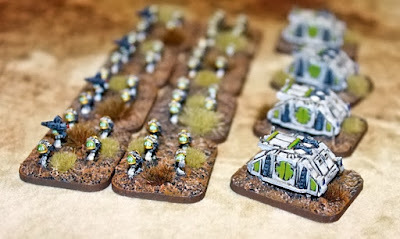 The infantry and rhinos are the old school original plastics, but I think they still hold up just fine (and I have a ton of them still on sprue) so I am just using them for most infantry, instead of the real 30k metal ones. Now onto some of the figures that I have really wanted to paint for a long while! A squad of three Sicarans and Sicaran Venators! These are amazing models in 28mm and the 6mm versions are just as clean, every single panel line and cable from the full size version is there on the 6mm version. These two versions of the Sicaran are my favourite tanks in 30k as I feel they are one of the best looking sci-fi tank hulls out there in any game or fiction. They have huge guns, an aggressive sloped stance that just scream speed and aggression, what more could you want. Lastly, 3 super heavy tanks, because why just kill something when you can kill it, then vaporize it, then annihilate any dust left from it. When you want something dead, overkill is the only way to go. Besides, all 3 of these vehicles are just stunning. The whole force was painted very quickly (as you can tell from the images) but I think came out very well for anything 6mm and have a suitable dirty used look for me, but not too dirty that you can't tell what they are. This entry has been 2+ years is the making as I keep trying to get to them and keep leaving them, because I hate painting horses. In miniature, painting horses intimidates me as they are much like painting human flesh, just a lot more of it. It is really hard to get right, insanely easy to screw up, and everyone will notice and point out when it isn't right. Therefore I really try to avoid painting horses if at all possible. I have however needed to get a unit of cavalry done for my (very slowly) growing 28mm French Napoleonic force for a while now, and this unit got primed for last years challenge and then set aside as I just didn't want to deal with them. This year I decided I better get to them sooner rather than later or they would once again roll over to the next years challenge. 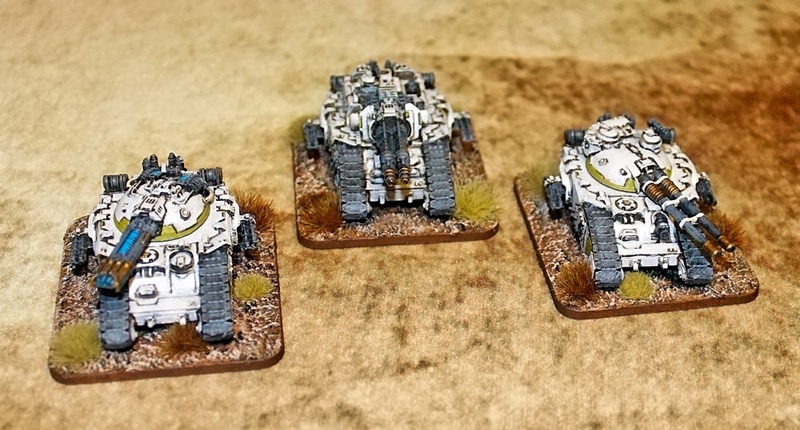 Minor issues aside, while I disliked painting the project, I am actually OK with the results close up, and I am very happy with how they look on the tabletop. Which is what Napoleonics are all about, tabletop effect, and that they have. 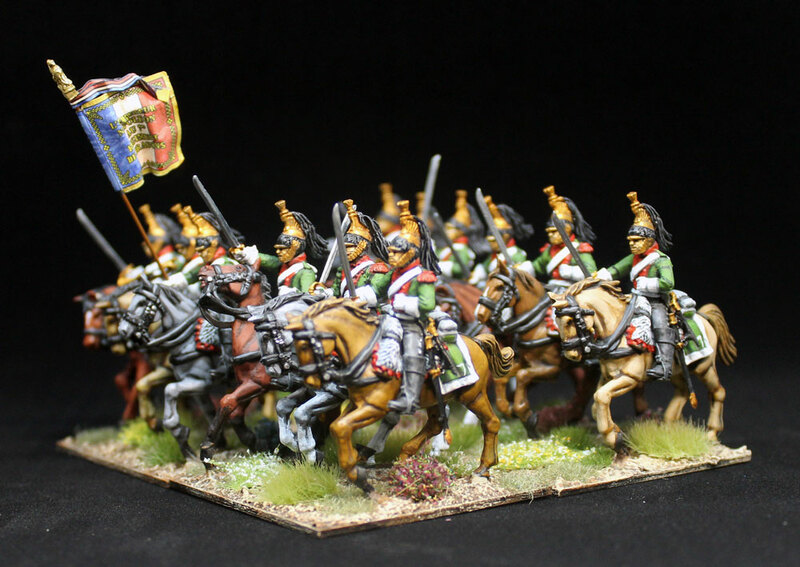 Theses are all the plastic 28mm Perry Miniatures Dragoons with a Flag Dude banner. Knowing that I disliked the horses, I started with them. 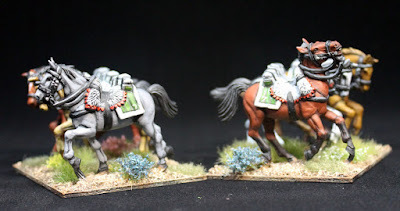 Having read that the Dragoons were the bottom of the Cavalry types (having started as infantry being trained as cavalry) and therefore very often had to deal with any mounts they obtain rather than being able to count on standard or uniform mounts for a regiment, I decided to make the unit up of as many different types of horses as I could. Not knowing anything about horses though I had to go looking to find out what kinds and colours they did have. After finding out about Bays, Palominos, Chestnuts, Greys, and more, I got to work. Then I found out about facial markings and socks. Did I mention, I hate horses? Anyway, after far too long on the painting table, I came out with the following which I am actually OK with. 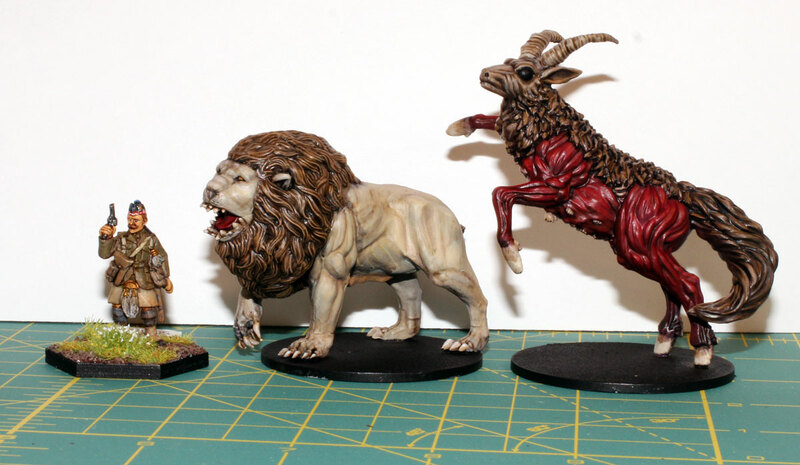 Which is fairly uncommon for me, as I tend to think of 80% of the stuff I paint as crap, but despite my dislike for the animals and painting them, I am actually OK with how these look. A small submission to keep my progress going this week. 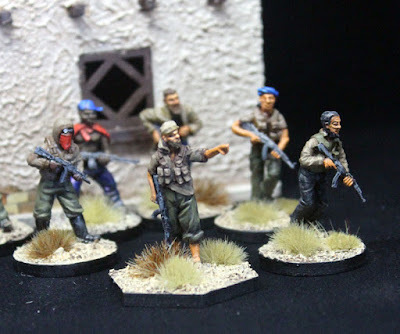 The entry is an amalgamation of some left over African Militia from Spectre miniatures and some Islamic Terrorists from Spectre as well (Sorry Curt, those words probably just got this blog flagged by the CIA, FBI, and more). The figures themselves are awesome as usual from Spectre, lots of detail on them and accurate (if thin) weapons. Total there are 18 figures here, all done to a very basic table top level. Essentially a base colour, wash, highlight, some very small details. 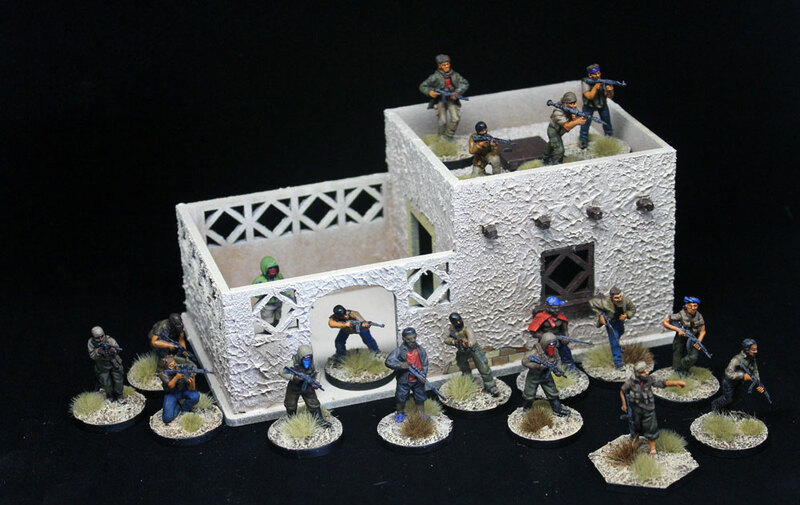 Since all of these miniatures will be on, and then off the table so quickly, I just couldn't justify a whole lot of time on them (as is evident in the pictures). To play the games I want with them, I need about 40-50 Terrorists or Militia facing 4-8 special forces troopers, so I tend to spend time on the spec ops guys as they will be the focus of any game as they stick around for the whole time (normally). So, there we are, my five regular entries so far in the challenge. I will try to keep up better cross posting so that the posts don't get so long in the future. Great stuff Byron - that French cav unit in particular is fantastic.